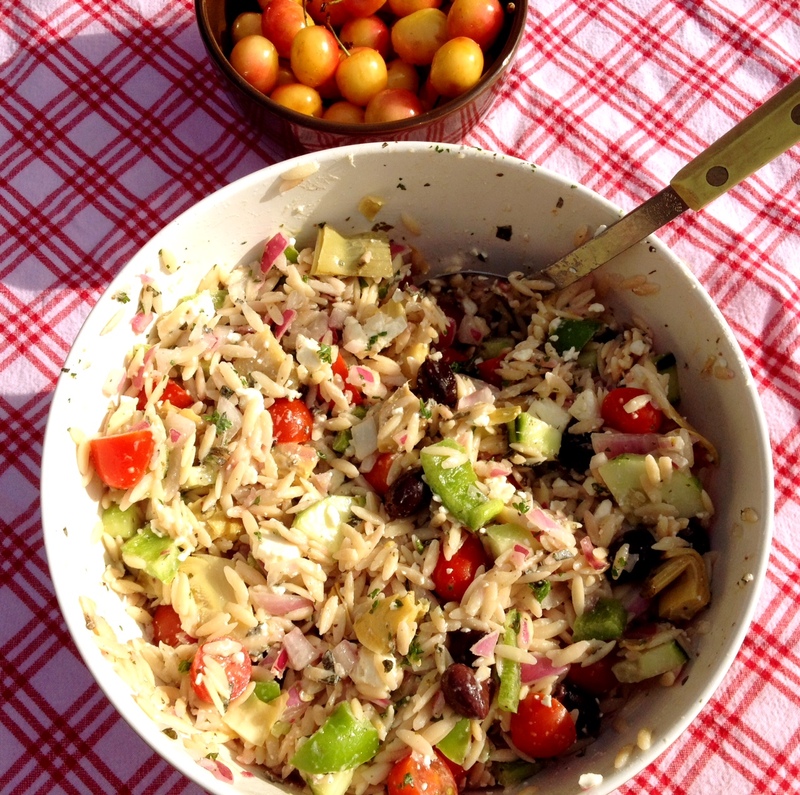 The other great thing about this Greek Orzo salad? It’s easily adaptable. Don’t like onions? Leave ’em out! Prefer black olives over Kalamatas? Go for it! This recipe is so easy, I probably make it a little different each time, but with the same end result: delish. You can easily make this a day in advance. 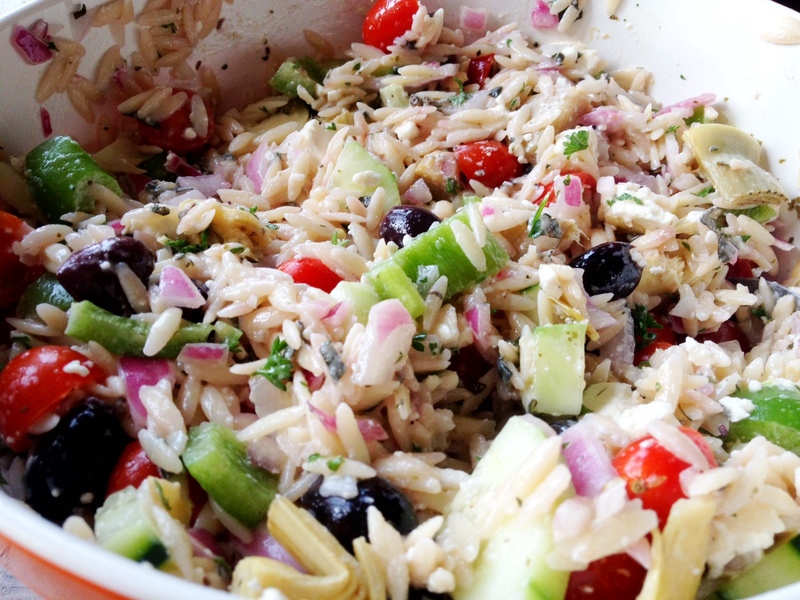 I like to make the orzo and add the onion, olives, artichoke hearts, herbs and oils a day before then throw in all of the veggies right before serving so they are super fresh and crunchy. Adding the cheese on top and a few more herbs will make initial presentation pretty, but I totally forgot (shocker). This salad is great for leftovers and keeps for a few days stored in an airtight container in the fridge. 1. Bring a large pot of lightly salted water to a boil. Add Orzo and cook for 8 – 10 minutes (or according to box instructions); drain. 2. 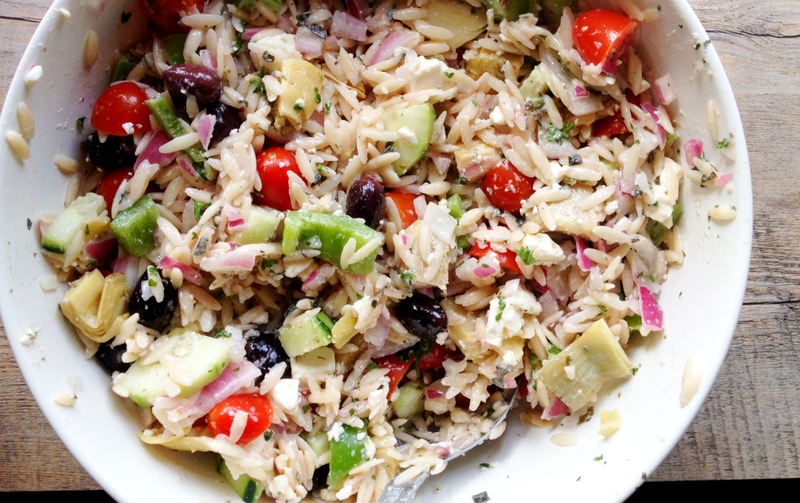 In a large bowl combine artichoke hearts and liquid, tomato, cucumber, onion, feta, olives, green pepper, parsley, oregano, lemon juice, and lemon pepper. Taste for seasoning, add a splash of olive oil, red wine vinegar, a sprinkle of salt. Repeat until you get desired flavor. Toss and chill for 1 hour in refrigerator. 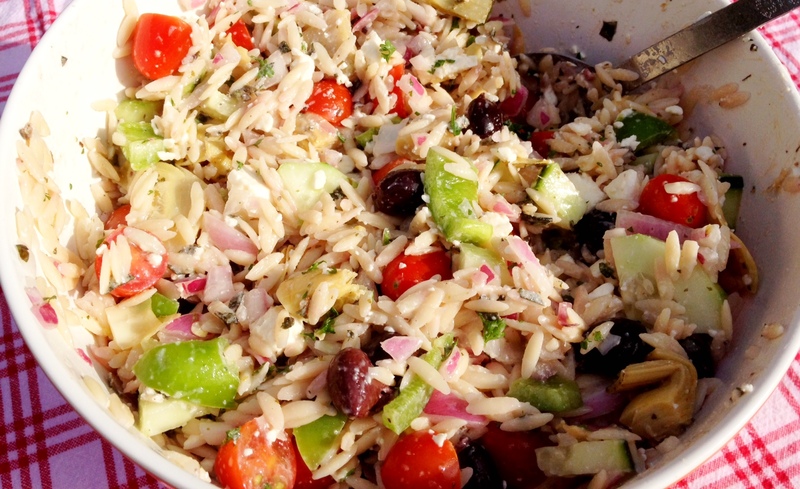 Make Ahead: In a large bowl combine the cooked orzo, artichoke hearts and liquid, onion, olives, parsley, oregano, lemon juice, lemon pepper, olive oil, red wine vinegar, and salt. Let sit in fridge overnight then add tomatoes, cucumber, green pepper, and feta right before serving.